The Sgt. 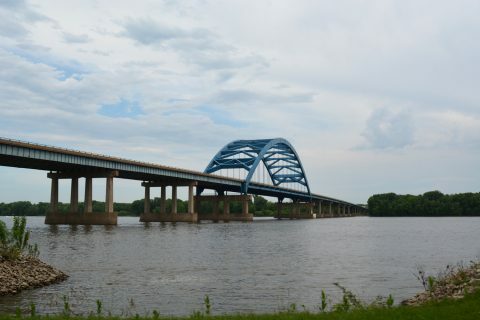 John F. Baker, Jr. Bridge carries Interstate 280 across the Mississippi River between southwest Davenport, Iowa and southwest Rock Island, Illinois. Photo taken 05/28/18. Forming the western and southern half of Quad Cities (Moline, Rock Island, Bettendorf, and Davenport) beltway system, Interstate 280 provides a bypass for long distance travelers between Des Moines and Chicago. The freeway begins at a rural directional T interchange with I-80 in northwest Davenport. Heading south, the route doubles as U.S. 61 by West Lake Park to West River Drive, where U.S. 61 turns west toward Blue Grass and Muscatine. The remainder of I-280 in Iowa angles southeast to cross the Mississippi River near Credit Island Park. Within Illinois, I-280 travels generally east-west while paralleling the Rock River. A freeway spur, Illinois 92 / Centennial Expressway, connects the bypass with Downtown Rock Island from Exit 11. East from there and the Jumer’s Casino complex, Interstate 280 continues through the village of Milan to Quad City International Airport (MLI). Just north of the airport is the cloverleaf interchange joining I-280 with Interstate 74. The two overlap along a 9.4 mile exit less stretch to the eastern terminus with Interstate 80 and the I-74 turn south toward Galesburg and Peoria. 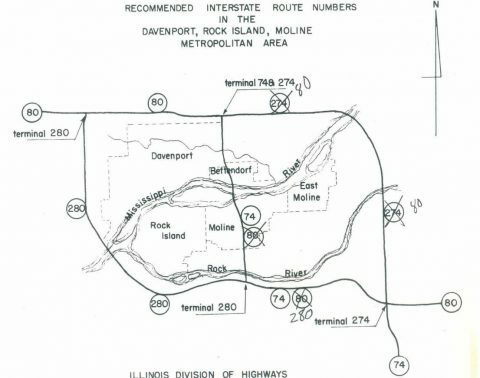 A numbering change was proposed by the state of Illinois in 1991 to renumber existing Interstate 280 as Interstate 80, change existing I-80 to Interstate 74, and redesignate the north-south section of I-74 (including the twin suspension bridges) as Interstate 174. 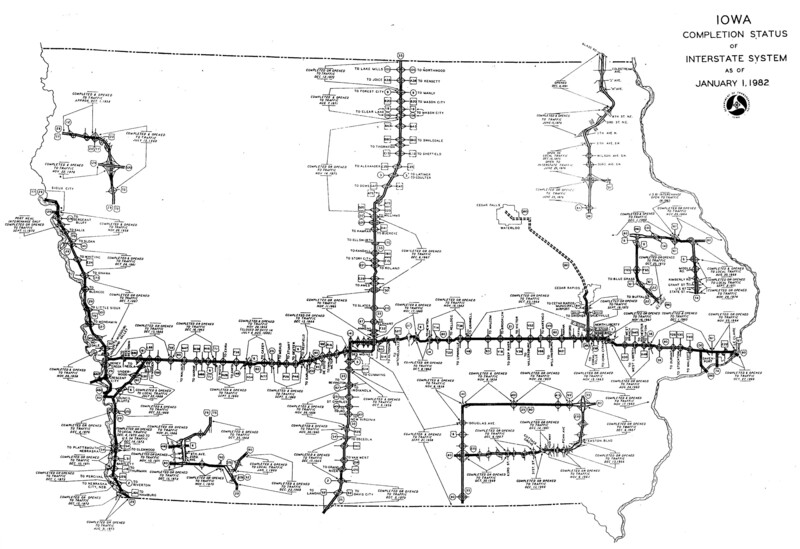 This action was not considered by AASHTO at their Special Committee on U.S. Route Numbering meeting on June 10, 1991 because the state of Iowa did not submit companion applications. Interstate 280 within Iowa consisted of just a connector between I-80 and U.S. 6 (Kimberly Road) from 1960 to 1973. U.S. 6 was relocated onto this connector in 1980 as it bypassed Walcott, Durant and Wilton via I-80 west. Interstate 80 west defaulted onto I-74 & 280 to U.S. 6 & 150 south of Moline. The tolled Iowa-Illinois Memorial Bridge (later I-74) carried the bulk of through traffic at the time. 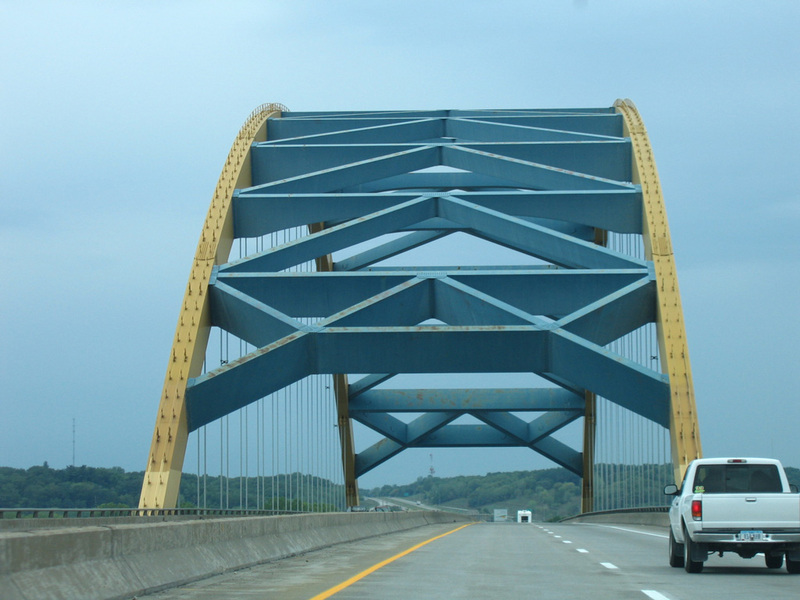 The 1973 color scheme for the span carrying Interstate 280 across the Mississippi River was blue and yellow. The tied arch bridge was repainted in 2007. Photo taken 09/04/05. Interstates 74 & 280 swing south from the Rock River to elevate across a series of hills to the unnumbered interchange with I-80 & Illinois 110 (CKC). Photo taken 05/20/15. Curving southeast, Interstates 74 & 280 skim southern reaches of the Colona city limits to the full cloverleaf interchange with Interstate 80 & IL 110. Photo taken 05/20/15. A formal end shield for Interstate 280 precedes the departure of I-74 east. The following mainline movement for I-74 is regarded as a TOTSO (Turn Off To Stay On). This type of connection is discouraged from modern Interstate design. Photo taken 05/20/15. Interstate 74 turns due south with IL 110 (CKC) from the ending I-280 along a rural route with few exits to Galesburg. Photo taken 05/20/15. A loop ramp begins the I-80 eastbound mainline onto the concluding I-280. An I-88 trailblazer directs motorists north onto the adjacent ramp for the intrastate route linking East Moline with Chicago. Photo taken 05/20/15. Highway Gothic font based signs posted at the end of the I-74 & 280 nine mile overlap at Interstate 80. Photo taken 09/04/05. These signs for Interstate 80 at the I-280 terminus were also replaced with Clearview font based panels by 2010. Photo taken 09/04/05. Interstate 80 east & Illinois 110 (Chicago Kansas City Expressway) south travel through eastern reaches of Colona to the Big X interchange with I-74/280. A diamond interchange (Exit 9) precedes the freeway connection with U.S. 6 in one mile. Photo taken 05/28/18. U.S. 6 heads east from Colona to parallel Interstate 80 to Geneseo and Atkinson. I-80 resumes an eastern heading in 1.25 miles at the return of I-280 and southward turn of I-74. Photo taken 05/28/18. Continuing south, motorists along I-80 & IL 110 next reach the westbound ramp back to Moline and Rock Island. Photo taken 05/28/18. Interstate 280 begins as I-74 turns west toward Moline, Bettendorf and Davenport. A loop ramp follows as the I-80 eastbound mainline toward Chicago. Photo taken 05/28/18. Interstate 74 east takes over for the departing Interstate 80. Illinois 110 (CKC), designated in 2011, joins I-74 south to Galesburg and the U.S. 34 freeway. I-74 otherwise turns east to Peoria and Bloomington-Normal. Photo taken 06/01/11. An 8.8-mile exit less stretch along Interstate 80 west concludes in two miles at the full cloverleaf interchange with I-74 and I-280 west. Photo taken 09/04/05. 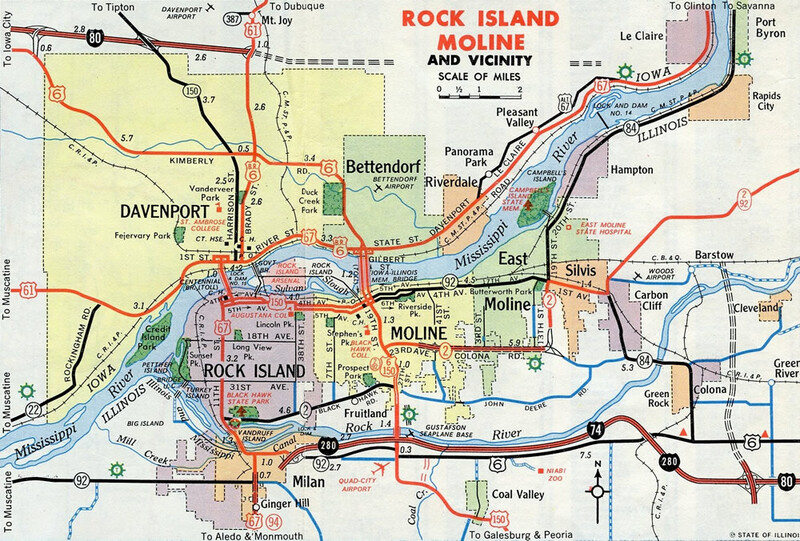 The Interstate 80 westbound mainline transitions directly onto Interstates 74 & 280 west to Moline while I-80 uses a TOTSO connection to turn north to Colona, East Moline and Le Claire. Photo taken 09/04/05. Interstate 280 begins as I-80 turns north to bypass the Quad Cities to Bettendorf, Iowa. I-74 & 280 travel 9.4 miles west uninterrupted to their split by Quad City International Airport (MLI). Photo taken 09/04/05. A loop ramp follows onto Interstate 74 leading southeast to Peoria. I-74 west leads to Downtown Moline and Downtown Bettendorf while I-280 skirts southern reaches of Rock Island. Photo taken 09/04/05. The original control city for Interstate 80 west at the exchange with I-74 and I-280 was Des Moines. 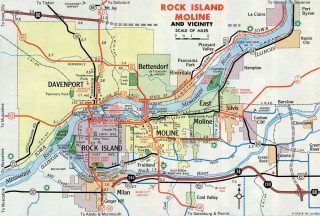 Note also that Moline and Rock Island were hyphenated. Photo taken by Michael Summa (1976). A 9.5 mile exit less stretch along I-74 west & IL 110 (CKC) north culminates at the Big X interchange with I-80/280 in two miles. Photo taken 12/20/09. North 1900th Avenue spans I-74 westbound on the one mile approach to I-80 east to Joliet and Chicago. Photo taken 05/24/18. Entering the unnumbered cloverleaf interchange with I-80 and I-280 west on I-74 west & IL 110 north southeast of Colona. Photo taken 05/24/18. A loop ramp takes the Interstate 74 westbound mainline onto I-280. Cosigned with Interstate 280 for nine miles, the final segment of I-74 runs north-south through from Quad City International Airport (MLI) and I-80 in northeast Davenport. Photo taken 12/20/09. 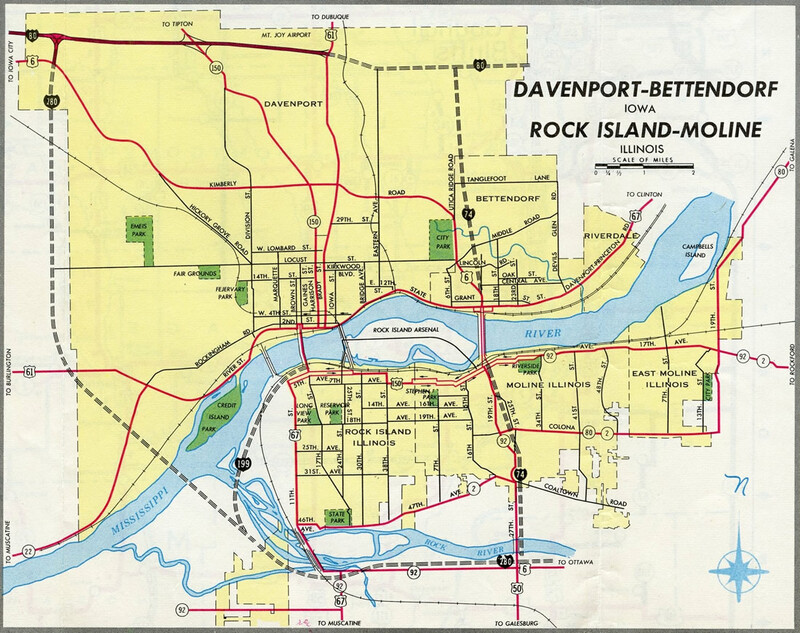 I-280 runs along the south side of Moline and Rock Island to southwest Davenport, Iowa. I-74 connects the belt route with Bettendorf, Iowa to the north. Photo taken 04/08/13. See the Interstate 74 West – Peoria to Quad Cities highway guide for additional photos from this direction. Interstate 280 west approaches Exit 1 with U.S. 6 (Kimberly Road) east and County Route F-58 west (Historic U.S. 6) west. CR F58 was designated on July 1, 2003 in place of Iowa 927. IA 927 previously ran west along what was U.S. 6 to Walcott. Photo taken 09/04/05. Entering the parclo interchange (Exit 1) with U.S. 6 (Kimberly Road) east and CR F58 (200th Street) west on I-280 west & U.S. 61 north. Traffic continuing north defaults onto Interstate 80. Photo taken 09/04/05. U.S. 6 west combines with I-280 west & U.S. 61 north to make the connection with Interstate 80 west. I-80 & U.S. 6 overlap for 19 miles to a point north of Wilton. Photo taken 09/04/05. Two lanes of I-280 & U.S. 6 west default onto Interstate 80 west. Iowa City is 44 miles away while drivers reach the state capital in 159 miles. U.S. 61 north combines with I-80 east to the cloverleaf interchange with Brady Street in north Davenport. Photo taken 09/04/05. Interstate 80 turns from the southeast to east on the two mile approach to Interstate 280 east, U.S. 61 south and the split with U.S. 6 east. Photo taken 06/19/15. Greenouts to signs for the Interstate 280 junction were made in 2011 to reflect the relocation of U.S. 61 from an in-city route through Davenport to a bypass along I-280 south and I-80 east. Photo taken 06/19/15. Maysville Road passes over Interstate 80 & U.S. 6 east as drivers enter the directional T interchange (Exit 290) with Interstate 280 and U.S. 6. Photo taken 06/19/15. A single lane ramp departs I-80 east for Interstate 280 east to Rock Island, Milan and Moline, Illinois. U.S. 6 departs to the immediate south for Kimberly Road east through north Davenport. Photo taken 06/19/15. These signs were adjusted in 2011 to show U.S. 61. 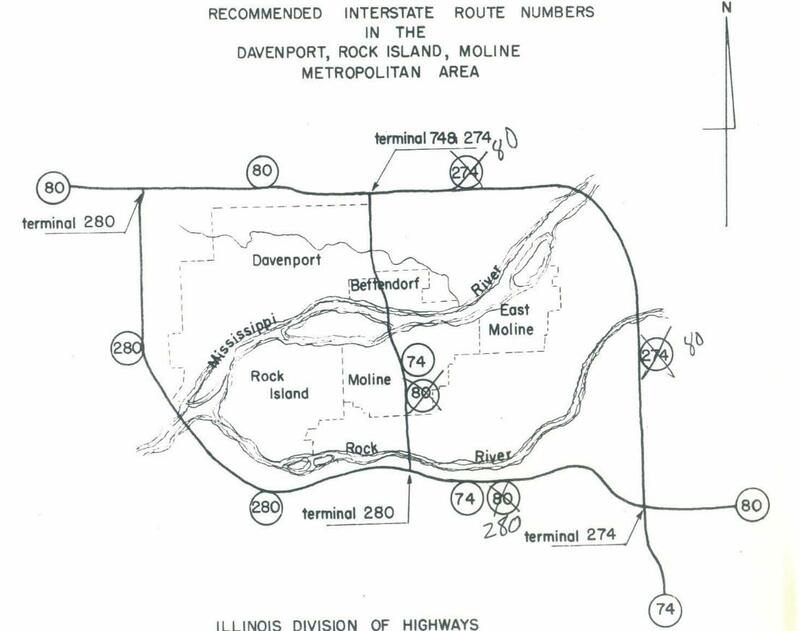 I-80 and U.S. 61 overlap east for five miles while I-280 drops southward 11 miles to Rock Island. Photo taken by Jim Teresco (07/01). 1.75 miles ahead of the left exit for Interstate 280 east, U.S. 6 east and U.S. 61 south. Interstate 280 provides part of a bypass for U.S. 61 south from Dubuque and De Witt to Blue Grass and Muscatine. Photo taken 03/28/16. Leaving the outer suburbs of Davenport behind, Interstate 80 west & U.S. 61 south advance to within one mile of their split at Exit 290. Photo taken 12/13/14. U.S. 6 joins westbound Interstate 80 at forthcoming Exit 290 for the first of several overlaps across the state. Statewide, the US route otherwise closely parallels Interstate 80, offering a local alternate route to the freeway. Photo taken 12/13/14. U.S. 61 south parts ways with I-80 west as U.S. 6 enters from the south. There are four Davenport area interchanges on Interstate 280 south. The freeway is mostly rural to the Jumers Casino at Rock Island, Illinois. Photo taken 12/13/14. All guide signs for Interstate 280 east on I-80 west & U.S. 61 south were replaced by 2014. Photo taken 09/04/05. Nearing the left-hand ramp with I-280 & U.S. 6 east back into Davenport. 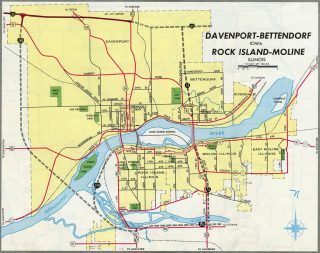 Davenport is the largest of the four Quad Cities. The municipal boundaries extend west to cover all of I-280 in Iowa. Photo taken 09/04/05. Exit 290 departed from Interstate 80 west for I-280 east back to Rock Island, Illinois. Photo taken 09/04/05. “IOWA WINS INTERSTATE INTERSTATE BATTLE FHWA WON’T CHANGE NUMBERING OF HIGHWAYS IN QUAD CITIES REGION.” Peoria Journal Star, The (IL), July 3, 1993. “I-280 bridge gets the blues – Span no longer will sport unique yellow on arch.” Quad-City Times, The (IA), September 14, 2007. “Illinois set to name I-280 bridge after Vietnam War hero – John F. Baker Jr. is a Medal of Honor recipient.” Quad-City Times, The (IA), May 3, 2008. Page updated June 5, 2018.